Mmmm chocolate. Your shortbreads look pretty perfect. I would be perfectly happy eating just the shortbread cookies alone. But life sure is more meaningful with added ganache. My favorite cookie of all time is shortbread, and especially the chocolate variety. 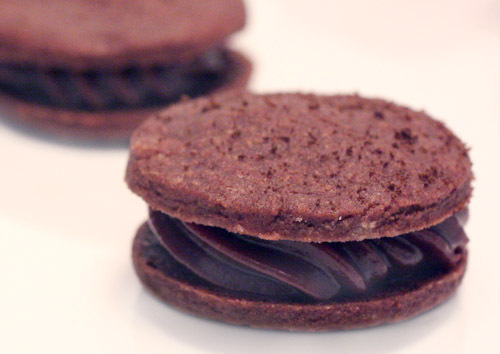 Adding a chocolate filling just takes it over the moon! I'm adding this recipe to my delicious bookmarks! Oh my goodness, those look addicting! YUMMY! These look perfect - I love your addition of espresso powder! I could eat like 20 of those, I would just pop them until I got a bellyache. I would be happy to have some of these in place of dinner - or breakfast - or lunch. they look beautiful and I'll bet they're wonderful. Your chocolate shrotbread is truly beautiful and delicious looking Lisa! You had me at chocolate, but those cookies really do look delicious. Must get over my fear of rolling out dough--I have bookmarked several sandwich cookie recipes lately. Oh wow, they're beautiful and sound so decadent! That truffle cream filling sounds addicting! A chocolate heaven! The truffle cream filling sounds wonderful! Mmmmm. With treats like this, I cant understand how you still don't like chocolate! I love shortbread and I love chocolate so this recipe sounds perfect!!! wow..these look good. I would have to stop myself from eating the entire batch! I will take one dozen to go, please! Every time i come here, there is a pretty surprise waiting:-) the truffle looks divine. I am kind of the same way about chocolate, but oh my that truffle cream sounds amazing. Wow. I am a serious chocolate fiend so these look and sound delectable! My heart skipped a beat when I read that title!!!!! AMAZING! I might have skipped the cookies and eaten the truffle creme with a spoon! Hehe. These look too good to be true! 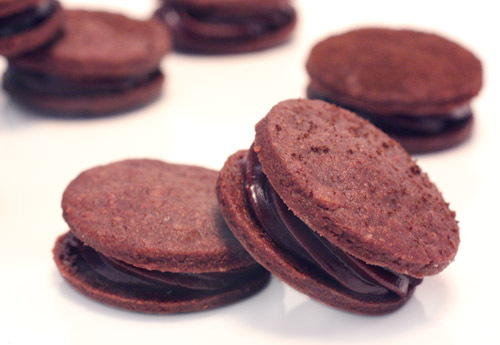 I've had a fierce chocolate craving lately -- these look just about perfect. I'm not sure mine would ever make it to sandwich status though -- too tempting to eat as they come off the tray. If I did manage a sammich, the other half of my household would definitely vote for the ice cream version. Those look absolutely gorgeous. I think the piping was definitely the way to go. They look so elegant. Great googly moogly those look amazing! I see the truffle cream is chocolate too! Chocolate heaven...oooh-lala! A cookie and truffle all in one! My kind of treat. They look so rich and professionally made. The filling looks delicious! They look perfect! I love the swirl that the piping bag has given to the filling.. I can't resist chocolate... gotta have it! 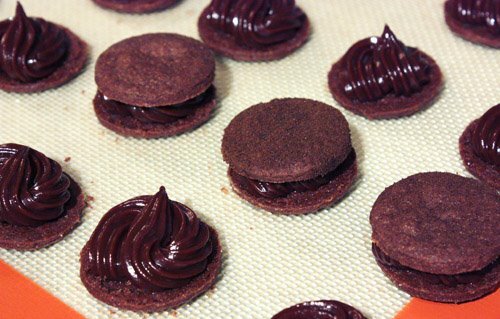 OOOOOOH,...These choclate cookies look so excellent & i like the filling too! they are very well presented too! What delicious looking cookies! Wonderful! OMG, those cookies are so tempting! A luscious treat! Oh wow, they looks so delicious! And so expertly made! Beautiful! These are so gorgeous - and so fancy looking. The truffle filling sounds incredible. Such decadent little treats! "When given a dessert menu, I probably won’t select a chocolate option, but . . . 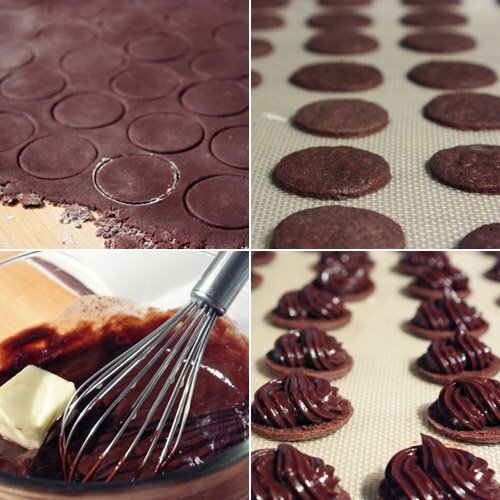 I get inspired to bake with chocolate. " I'm the same way! I consider myself a bit of a chocoholic, but when out and about, I usually opt for other flavors. It's just as well that I'll need to find this book in order to get the truffle recipe. Otherwise, I'd be rummaging through the kitchen and making dash to the store so that I can make it ASAP! These are unbelievably delicious-looking! Love Chocolate cookies!! I will have to make this recipe tonight!